SAR014712 SCOTLAND (1951). Albert Bridge to George V Bridge Glasgow, Lanarkshire, Scotland. An oblique aerial photograph taken facing North/West. This image was marked by AeroPictorial Ltd for photo editing. Title [SAR014712] Albert Bridge to George V Bridge Glasgow, Lanarkshire, Scotland. An oblique aerial photograph taken facing North/West. This image was marked by AeroPictorial Ltd for photo editing. The Justiciary Courts (Old Glasgow High Court.) were designed by William Stark and erected at the foot of Saltmarket 1809-1814. The building originally housed the city's municipal offices and 122 prison cells, as well as court rooms. The open area in front of the building was used as the site of public executions until 1865, giving rise to an old Glasgow warning "You'll die facing the monument" - prisoners were hanged facing the Nelson Monument on Glasgow Green. The last man to be executed there was the infamous poisoner Dr Pritchard. The building was remodelled in 1845 after the municipal offices moved to the City and County Buildings in Wilson Street and reconstructed (with the addition of a second court room) in 1910-1913. Carlton Place on the south bank of the Clyde opposite the city centre. In the centre with the tower is Gorbals Parish Church, which was demolished in 1973. Designed by Peter Nicholson in 1802, Carlton Place was the showpiece river frontage of John Laurie's development of a high-class residential area, which he named Laurieston, to the south of the River Clyde. Despite considerable investment, however, Laurieston failed to become an exclusive suburb - the establishment of heavy industries in the area, and the unpleasant atmospheric pollution that they created, meant that affluent Glaswegians preferred to move to homes in the West End. Italian tradesmen executed the sumptuous plasterwork and internal decoration in some of the buildings. This is especially true of Laurieston House, (No 52), the main feature of the terrace and once the home of John Laurie and his brother David. It is regarded as the most splendid, intact Georgian house in the city. Carlton Place has recently been restored to something of its original glory, and there are proposals to allow the public access to the restored Laurieston House. St. Enoch Sq. undergound and St. Enoch Hotel. 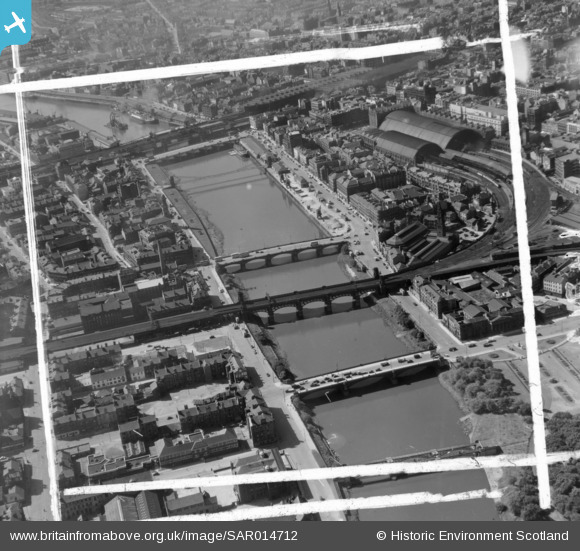 Caledonian Railway Bridge (1st) 1878. Piers, steel arch. Train leaving St Enoch Station.